Nico and Lala offer custom Christmas cards in digital, letterpress, foil stamping, engraving, and thermography! If you prefer the photo printed ON the card, digital printing is recommended. If you prefer the photo adhered to the card, then any print style is possible! The design fee is $100 and standard printing is on 100# card stock and pricing is based on your quantity of cards. Nicer forms of printing can be quoted out upon request! Often our custom Christmas cards are based on children’s clothing in the photo, however your design ideas are welcomed, as well as any greetings or Bible Verses you would like to be included! 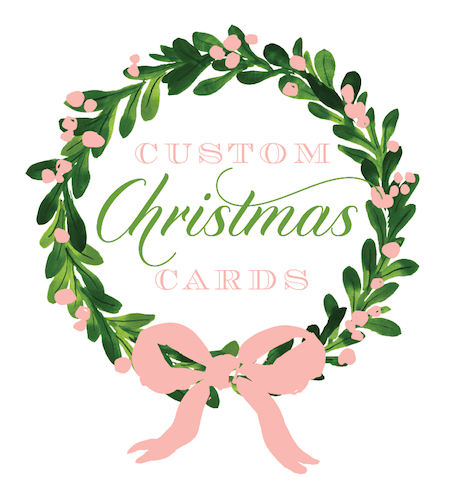 Looking for more ideas for your custom Christmas card? If you are anything like us, social media and Pinterest are the best places for ideas! On our Instagram page which you can see here, search for #nicoandlalachristmas and it will filter to only show you our posts related to the Christmas holiday! If you are more of a Pinterest fan, you can see our holiday card board here! And that’s not all! If you are needing help with any holiday party invitations, wether it is at your home or for a corporate event, please fill in the form on our Celebrations Page! Please fill in the contact form below if you are interested in our custom Christmas cards and note that we will only be accepting a limited amount of Custom Christmas card orders this year, so get those reindeer in gear, and Merry Christmas!